The Law Office of Aaron D. Bundy serves clients in Oklahoma state and federal courts in the areas of divorce, child custody, allegations of abuse, criminal defense, catastrophic injury and select employment cases. Every lawyer at the firm is a trial lawyer with litigation and trial experience in the firm's practice areas. 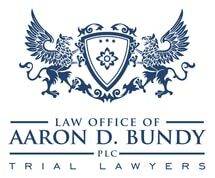 The Law Office of Aaron D. Bundy is different from other firms in its approach to clients and trial preparation. The firm's attorneys use the discovery and litigation process in a proactive manner to prepare each case for the best achievable resolution at mediation or trial. The firm offers witness preparation for clients that is unparalleled in the legal community. Where many firms assign one lawyer to each client, the trial lawyers at the Law Office of Aaron D. Bundy collaborate with one another on each case, resulting in the highest level of professional judgment and skill for each client. As a result, the firm is often hired late in cases when trial becomes an obvious necessity, and other attorneys in the community frequently call on the Law Office of Aaron D. Bundy to assist in briefing issues and co-counseling on cases at trial. The attorneys at the Law Office of Aaron D. Bundy are committed to professional development. Each attorney is a member of and involved in organizations such as the Association of Family and Conciliation Courts, which is an organization dedicated to improving the lives of children and families through the resolution of family conflict. The attorneys are meaningfully involved in local and state organizations related to family law and criminal defense. Every year, the attorneys identify and select professional training for themselves in order to improve their litigation and trial skills and offer the highest level of service to each client. Aaron Bundy is an award-winning trial lawyer who has over a decade of experience handling divorce cases and other high-conflict family issues. Mr. Bundy's trial experience includes cases concerning relocation of minor children, grandparent rights, division of personal and real property, prosecution and defense of contempt charges, and defense of clients in jury trials concerning parental rights and allegations of child abuse and neglect. Mr. Bundy has earned the prestigious rating of AV Preeminent* from Martindale-Hubbell. He has been selected for inclusion in the Super Lawyers and Rising Stars lists for six consecutive years and earned the Superb rating of 10.0 on Avvo as a Top Family Attorney. Mr. Bundy was recognized by the Oklahoma Bar Association in 2017 with the Earl Sneed Award for his outstanding contributions to continuing legal education for other attorneys in the state.